The Guardian reports that the still incoming Obama will abandon the isolation of HAMAS, considered a terrorist organization by Israel, the U.S. and the European Union, and is "prepared to talk to HAMAS"
Description: Formed in late 1987 as an outgrowth of the Palestinian branch of the Muslim Brotherhood. Various HAMAS elements have used both political and violent means, including terrorism, to pursue the goal of establishing an Islamic Palestinian state in place of Israel. Loosely structured, with some elements working clandestinely and others working openly through mosques and social service institutions to recruit members, raise money, organize activities, and distribute propaganda. HAMAS's strength is concentrated in the Gaza Strip and a few areas of the West Bank. Also has engaged in peaceful political activity, such as running candidates in West Bank Chamber of Commerce elections. Another potential contender for a -foreign policy role in the Obama administration suggested that the president-elect would not be bound by the Bush doctrine of isolating Hamas. The total isolation of Hamas that we promulgated under Bush is going to end," said Steve Clemons, the director of the American Strategy -Programme at the New America -Foundation. "You could do something through the Europeans. You could invent a structure that is multilateral. It is going to be hard for the neocons to swallow," he said. "I think it is going to happen." Obama adopted a strongly pro-Israel position to get elected. That was then. Now that he won the election, Obama apparently feels he can adopt what the liberals like to call a "more evenhanded approach" with the terrorists. Today, outlining his vision For Israel's security and the Middle East, Senator John McCain called on states to cut funds to the rogue state of Iran. McCain's remarks were made at the AIPAC Policy Conference, and came as Iranian President Mahmoud Ahmadinejad again predicted Israel will soon disappear. In A World Full Of Dangers, Israel And The United States Must Always Stand Together. As the threats to Israel's security increase, John McCain believes America's commitment must also grow. He strongly supports the increase in military aid to Israel scheduled to begin in October, and is committed to making certain Israel maintains its qualitative military edge. The Foremost Threat To Israel Is The Iranian Regime. Iranian President Mahmoud Ahmadinejad has called Israel a "stinking corpse" and for it to be "wiped off the map." Beyond the vile insults, the Iranian leadership acts in ways directly detrimental to the security of Israel and America. Iran's Leadership Has Repeatedly Used Violence To Undermine Israel And The Middle East Peace Process. Iran sponsors both Hamas and Hezbollah. It has trained, financed, and equipped extremists in Iraq, and remains the world's chief sponsor of terrorism. Iran's Continued Pursuit Of Nuclear Weapons Poses An Unacceptable Danger That We Cannot Allow. Emboldened by nuclear weapons, Iran would feel unconstrained to sponsor terrorist attacks. Its flouting of the Nuclear Nonproliferation Treaty would render that agreement obsolete and could induce others to join a nuclear arms race. There would be the possibility that Tehran might pass nuclear materials or weapons to terrorist networks. An Iranian nuclear bomb would pose an existential threat to Israel. Rather Than Sitting Down Unconditionally With The Iranian President Or Supreme Leader, John McCain Will Work To Create Real-World Pressures To Peacefully But Decisively Change Iran's Behavior. John McCain has been a leader on these issues, having coauthored the 1992 Iran-Iraq Arms Non-Proliferation Act. The United Nations Security Council Should Impose Progressively Tougher Political And Economic Sanctions. Should the Security Council continue to delay, the U.S. must lead like-minded countries in imposing multilateral sanctions outside the UN framework. John McCain Has Proposed Applying Sanctions To Restrict Iran's Ability To Import Refined Petroleum Products. A severe limit on imports of gasoline would create immediate pressure on Iran's leadership to change course, and to cease in the pursuit of nuclear weapons. We Will Encourage Those In The Region And Our European Partners To Impose Targeted Sanctions. These would include the denial of visas and freezing of assets. We Will Impose Financial Sanctions On The Central Bank Of Iran, Which Aids In Iran's Terrorism And Weapons Proliferation. We Will Apply The Full Force Of Law To Prevent Business Dealings With Iran's Revolutionary Guard Corps. John McCain was pleased to join Sens. Lieberman and Kyl in backing an amendment calling for the designation of the Revolutionary Guard as a terrorist organization. Over three quarters of the Senate supported this obvious step, but not Sen. Obama. We Will Launch A Worldwide Divestment Campaign. As more people, businesses, pension funds, and financial institutions across the world divest from companies doing business with Iran, the radical elite who run that country will become even more unpopular than they are already. The Palestinian People Are Badly Served With Hamas In Charge Of Gaza. This is a group that refuses to recognize Israel's right to exist, to denounce violence, and to acknowledge prior peace commitments. They deliberately target Israeli civilians, spread hatred, and set back their people's cause with every new bombing. We Hope That The Talks Between Israel And Palestinian President Mahmoud Abbas Will Yield Progress Toward Peace. While encouraging this process, we must also ensure that Israelis can live in safety until there is a Palestinian leadership willing and able to deliver peace. A peace process that places faith in terrorists can never end in peace. The International Community Must Support Our Allies In Lebanon. Israel's chance for enduring peace with Lebanon depends on a Lebanese government that has a monopoly on authority within its country's borders. We can fully empower our allies – not only with military aid but also with the resources to undermine Hezbollah's appeal: better schools, hospitals, roads and power generation. John McCain Will Bring More Attention To The Kidnapping Of Three Young Israelis In 2006. In the summer of 2006, Hamas and Hezbollah kidnapped three young Israelis and have held them ever since. John McCain has met with the families and will bring attention to their situation, insist that the Geneva Conventions are observed, and call for the swift release of these men. Succeeding In Iraq Is Critical To Israeli And American Security. Our troops in Iraq have made hard-won progress under General Petraeus' new strategy. Iraqi political leaders have moved ahead. Sectarian violence has declined. Sunnis are cooperating in the fight against al Qaeda. Shia extremist militias no longer control Basra. Al Qaeda terrorists are on the run. Senator Obama's Plan To Withdraw Regardless Of The Consequences Will Surely Result In Catastrophe. If our troops are ordered to retreat, we risk all-out civil war, genocide, and a failed state in the heart of the Middle East. Allowing a potential terrorist sanctuary would profoundly affect the security of the United States, Israel, and our other friends. McCain's entire speech, as prepared for delivery can be found in the extended post. It's true, as Abba Eban once said, "Palestinians never miss an opportunity to miss an opportunity." with Palestinian Authority Prime Minister Salaam Fayad. Fayad assured the delegation that there would be no reconciliation with Hamas; when pressed on the point, Fayad made clear that there was no wavering in his position. The very next day the Jerusalem Post revealed that the Palestinian Authority had given U.S. taxpayer dollars to Hamas. Fayad stared our representative directly in the face and lied to them about a fundamental question of national security. The Palestinian Authority's payment of Hamas salaries on Wednesday - the day PA Prime Minister Salaam Fayad told American congressmen there would be no reconciliation with Hamas - was nothing less than a "slap in the face," said Eric Cantor, a Republican congressman from Virginia. Congressman Cantor had told Fayad "very strongly" that "the US will not support a Palestinian Authority that has as part of its coalition a terrorist organization." Today Cantor sent the following letter to Fayad to highlight the consequences of what has occurred. Thank you for meeting with me and the rest of the United States Congressional Republican delegation on Wednesday, August 8th. While I was pleased to hear your reassurances that the Palestinian Authority will continue to isolate Hamas, the events of the past twenty-four hours have given me reason to question your representations. You can imagine my shock and disappointment the following morning, when our delegation learned from newspaper reports that your government is providing financial assistance to Hamas. This came less than twenty-four hours after you looked me and several other U.S. Congressmen in the eye and vowed that your government would not seek rapprochement with Hamas. Hamas is a terrorist organization whose mission it is to murder innocent civilians and destroy the state of Israel. There is no place for Hamas in your government and no room for their ideology among the Palestinian people. Without further explanation from you, I will feel compelled, upon returning to Washington, to forewarn my colleagues in the Congress that any visits with your government offer little value toward bringing peace and security to Palestinians and Israelis. Furthermore, I will help lead opposition in Congress to any proposed call for additional U.S. taxpayer dollars being sent to the Palestinian Authority. Peace and security in the Middle East will never be achieved without trust. I am pained by these events, and sincerely hope you will end your involvement with the terrorist organization Hamas. I look forward to your timely response explaining the misuse of U.S. taxpayer dollars. A Reuters photograph, distorted to show much heavier damage and smoke rising from buildings in Beirut, has been withdrawn and the photographer suspended after Reuters admitted the photo was altered. 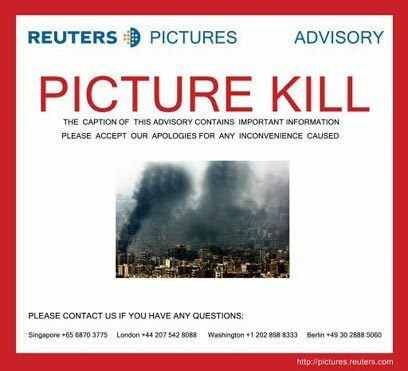 The Reuters caption on the doctored photo was: "Smoke billows from burning buildings destroyed during an overnight Israeli air raid on Beirut's suburbs August 5, 2006. Many buildings were flattened during the attack. REUTERS/Adnan Hajj"
In the withdrawal statement, Reuters said that "photo editing software was improperly used on this image." The photographer who sent the altered image, Adnan Hajj, is same Reuters photographer behind many images from Qana, which are suspected of being staged. Accuracy is among our most sacred journalistic values. That goes for the photographs, as well as the words, that we publish. Accuracy in the presentation of facts is what I expect from the press. Sadly, that expectation is all too often disappointed. Why is it that the American mainstream media hasn't published such images? It infuriates me that the main stream media focuses so much on the death of Lebanese civilians, but ignores Hezbollah endangering those civilians by using them as human shields. Where is the outrage over Hezbollah's deliberately putting Lebanese civilians in harms way and deliberately targeting Israeli civilians? International leaders failed to agree on the terms of a cease-fire between Israel and Hizbullah and called for talks on a United Nations-mandated force to help the Lebanese army restore peace in south Lebanon. Hezbollah, backed by and Syria, rejects a force that would eventually replace Israeli troops in a security zone. Israel has endorsed the idea of a European-led force though has said it should not be led by the UN, throwing into question the prospect of one ever being dispatched. What is needed is a cease-fire that will ensure the Hizbullah terrorists are no longer able to reek indiscriminate death and destruction whenever they choose to throw a temper tantrum. If ever a gang of terrorist thugs needed to be reined in, it is Hizbullah. Hizbullah's founding document calls for the destruction of the state of Israel. Hizbullah's record of terrorist attacks on the United States and its allies is long: the 1983 bombing of the barracks of U.S. Marines deployed peacekeepers in Beirut to keep the airport open for relief supplies; the bombing of the U.S. Beirut embassy in 1983 and 1984; the hijacking of TWA flight 847 and murder of U.S. Navy diver Robert Stethem in 1985; a series of attacks on Israeli targets in Lebanon; the bombing of the Israeli embassy in Argentina in 1992 and of a Buenos Aires Jewish community center in 1994. More recently, Hizbullah operatives have plotted to blow up the Israeli embassy in Thailand, and a Lebanese member of Hizbullah was indicted for helping to design the truck bomb that flattened the Khobar Towers U.S. military base in Saudi Arabia in 1996. The current "crises" stems from Hizbullah's unprovoked attack across Israel's northern border, killing and abducting Israeli soldiers. Let's not forget that in 2004 the UN Security Council adopted Resolution 1559 calling upon Lebanon to disband the military wing of Hezbollah. In 2005, the UN Security Council adopted Resolution 1583 calling upon Lebanon to exercise its sole and effective authority throughout the south. Again this year the UN Security Council called on Lebanon to make more progress in controlling its territory and disbanding militias. Had Lebanon complied with the UN demands, the present crisis could have been avoided. Secretary of State Condoleezza Rice is right to try "to bring about an urgent but enduring cease-fire in Lebanon, one that can deal with the causes of extremism that began this crisis and that can also lead to the establishment of the sovereignty of the Lebanese government throughout its territory." Anything short of an enduring cease-fire will simply encourage more violence in the long run.